I am sure it is for a good reason but this is what happens when your car is missing one headlight...a balanced car is so very important! Jamey F.: The "GoPro" would only mount crooked, can you drive a bit more sideways and up some on the right side? Christo T.: This is nothing; I can do cartwheels too! Jamey F.: Crazy uncle Marvin only appeared in some specialty adult videos in his native land of Germany while Herbie renounced his family lineage and moved to America where he became an instant star. 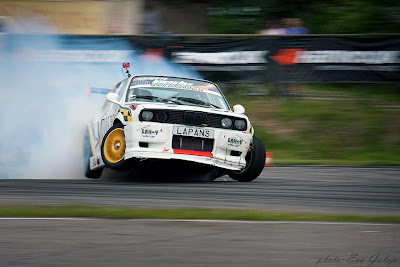 Mark V.: Let's see your E36 do this! OneHotLap: Going for the "murder flip" next! Françoise T.: ‎"take that Shawn White!" OneHotLap: Better haircut than White's even with that chewed up front spoiler too! Jamey F.: They say Germans love David Hasselhoff, apparently Europeans hate Shawn White? Jamey F.: Shawn White is very cool. If you don't know that then you're just reading internet articles and watching TV commercials. He's a serious playa!